ABC Reprographics provides the best in digital printing services in Denver. You can have your works reproduced in black and white or full color. Sometimes black and white is better. 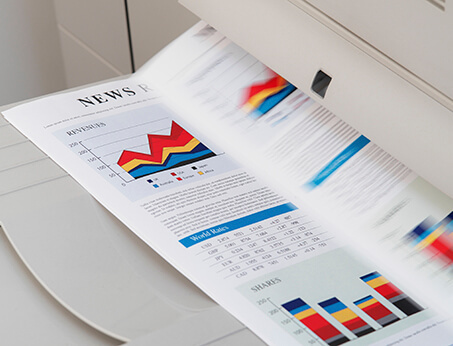 We can create elegant or modern prints, and we will take any hard copy or digital prints you have and reproduce high-quality prints or digital copies from them. Feel free to send us your digital or traditional photo prints online or stop into our office and show us what you have. For small orders, we can have them for you right away while you wait. The larger orders will be completed in a timely manner, and you can either pick it up or take advantage of our free delivery services. We also provide automated stapling in 12 different positions including saddle stitch. In addition, we provide single sheet trifold sheets, date stamping, page numbering and watermarks. If you have any further questions, please contact us as soon at your earliest convenience. ABC Reprographics will show you all your options for customized black and white prints, or ask about our full color print options. When you need both fast prints and jobs completed to satisfaction, ABC Reprographic offers quality Color Copying in Denver at rapid rates. Get your reproduced prints in the resolution you need in colors that are identical to your original. Our color printing in Denver includes many optional services, and you can choose from a variety of coated or uncoated stock paper. We offer a vast selection of binding and publication services for any project. We also provide automation with inline folding or saddle stitching booklets with face trim. Please contact ABC Reprographics about other publishing options we have available. Our friendly, knowledgeable, and skilled staff will walk you through all the steps of producing quality marketing materials. You can also place orders online and send us your digital full color files you want us to print. ABC Reprographics understands how important it is for you to portray the right message and image to your clients. Therefore, we provide advanced assistance with flyer printing in Denver with all the right colors and layout. We also provide black and white printing when it will portray the message you want to exhibit more effectively than color would. In addition, we offer full color and black and white brochure printing. Both our brochures and our flyers are designed complete with images, headings and text all laid out on the page just right. We can do the design or we can print what you have from your files. If you are looking for flyer printing in Denver, please contact us via telephone or email. You can also visit our office anytime. We are looking forward to helping you create literature for your business or organization that speaks to your target audience. If you want us to create a complete branding package for you, you can rely on us for that as well. ABC Reprographics will design your business cards, brochures, letter heads, flyers and more.